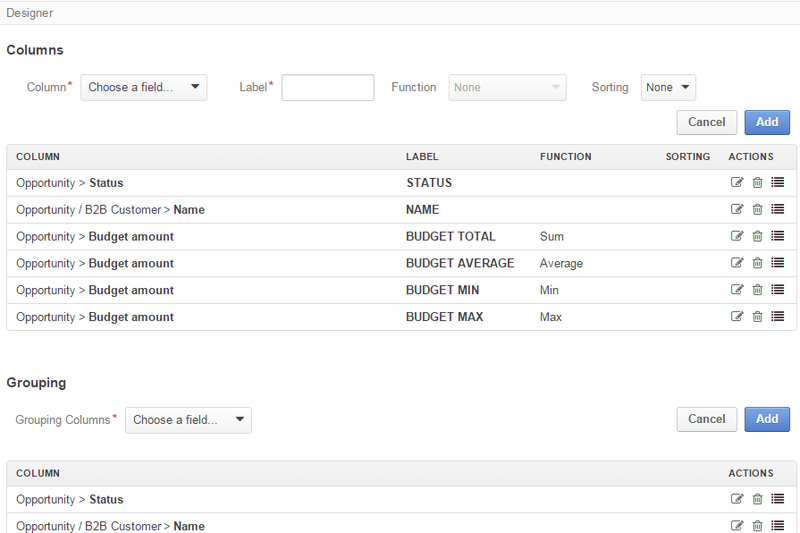 In OroCRM, you can create reports based on the details of any entity available in the system. Using this functionality, you can get easy-to-understand adjustable reports on the amount and activity of different customers, on statuses of carts and current state of actual and potential sales, on the performance of your marketing effort, specifics of recent activities, etc. There is a number of out-of-the-box reports, such as Leads by Date and Opportunities by Status , but you can also create your own (“custom”) reports. 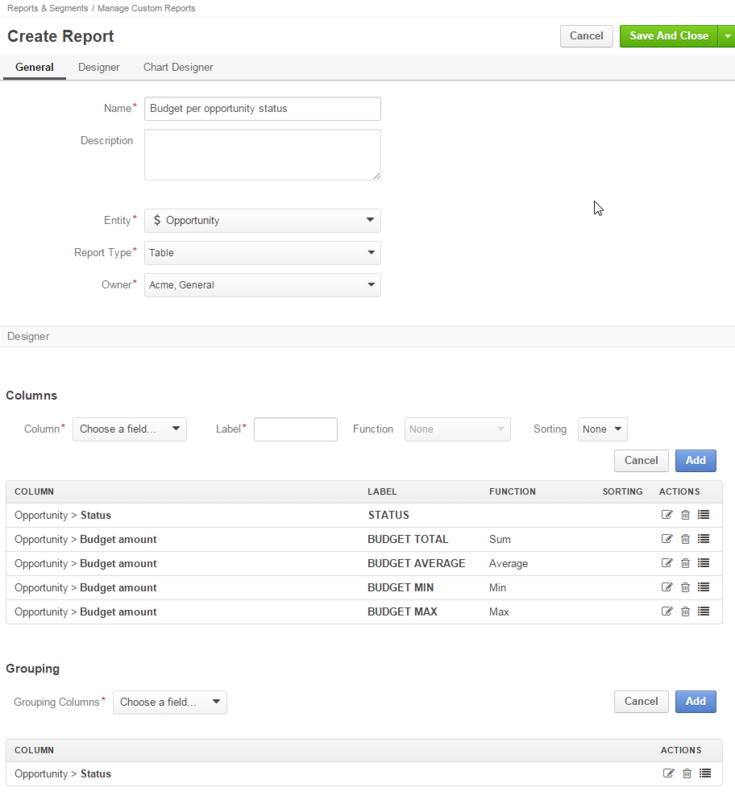 The article describes how to create and manage custom reports. 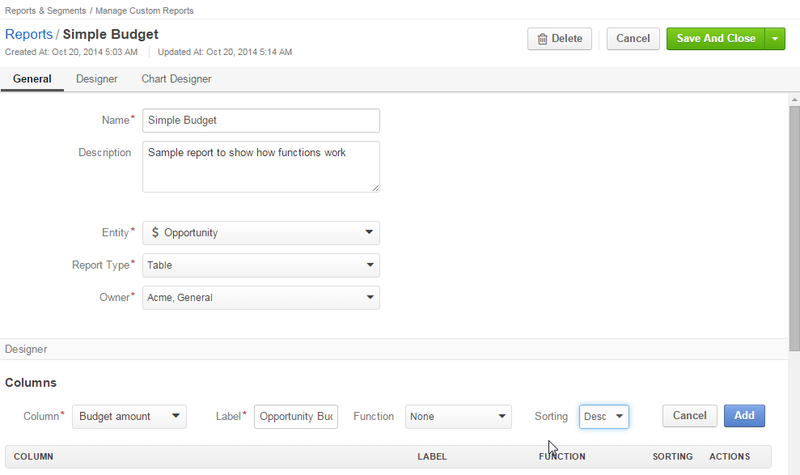 Go to Reports and Segments → Manage Custom Reports and click the Create Report button. The “Create Report”“ page will appear. The name is used to refer to the report in the future. It is recommended to use a name that is meaningful for you. Entity Target entity of the report. Choose one of the entities from the drop-down. Data related to it will be used to generate the report. (Both system and custom entities will be displayed in the alphabetic order). You can also start typing the entity name in the text field to find it faster. Report Type Only table reports are available. Owner Limits the list of users that can manage the report, subject to the access and permission settings. The only optional system field, Description, can be used to save additional information about the report. In the section you can define the structure of your report. Columns: defines the columns of your report and information displayed therein. 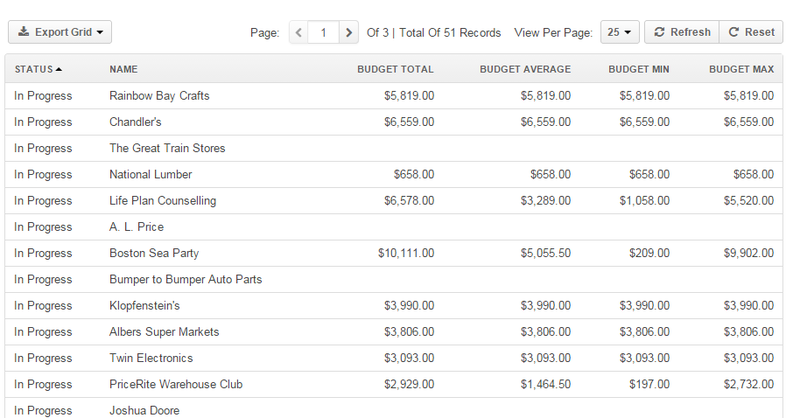 Grouping: defines how details of the report will be grouped in the rows. Filters: filter the records to be processed by the report. Choose a field* Choose a field from which raw data will be taken. This can be a field of the entity specified in the general settings of the report or of a related entity. All the fields available will appear in the drop-down list under their entities. A free text field that defines how the field chosen at the previous step will be referred to in the report. The field is automatically filled by the field label, but may be edited for each report. A function to perform with the field values. You will only see the functions available for the field chosen. None: no function applied. The data will be displayed for all the available entity records. Count: you will see the number of possible values of the field for all the entity records. Sum: the field values for all the entity records will be summed up. Average: the arithmetical mean of the field values for all the records against the amount of records will be displayed. Min: only the smallest of all the field values for all the records will be displayed. Max: only the largest of all the field values for all the records will be displayed. Defines the order values, in which the field or their functions shall be displayed in the report. The whole report is sorted by the column, to which the sorting is applied. If sorting settings are defined for several columns, settings of the column that comes the earliest are used. Once you have specified the settings for a column element, click the Add button, and the field you have defined will appear in the “COLUMN” grid. Now you can edit ( ), delete ( ) or move ( ) the column. For the sake of example, we have created a very simple report of one field. It contains only the budget amount details. Click the Add button to add the settings into the Columns grid. Click the Save. There are 75 opportunities with the values defined in the Budget Amount field of each and all of them will be displayed in the report. Click Edit to return to the report settings. Let’s see, how the report changes, if we apply different functions to the Opportunity Budget field. Click the icon and change the column settings. There are 43 different values of the Budget Amount field for all the Entity instances in the System. The sum of all the values of the Budget Amount fields for all the Entity instances in the System makes $202,565.00. The Grouping section can be used for more complex and informative reports. Once you have added a field in this section, you will see information based on the values of all the column with the same grouping field. For example, you can see a total, average maximum and minimum budget amount for each the opportunities with the same status. Fields used for grouping must be added to the COLUMN section as well. You can also group records inside a group. For example, we can add one more grouping field (e.g. customer name) to our report. 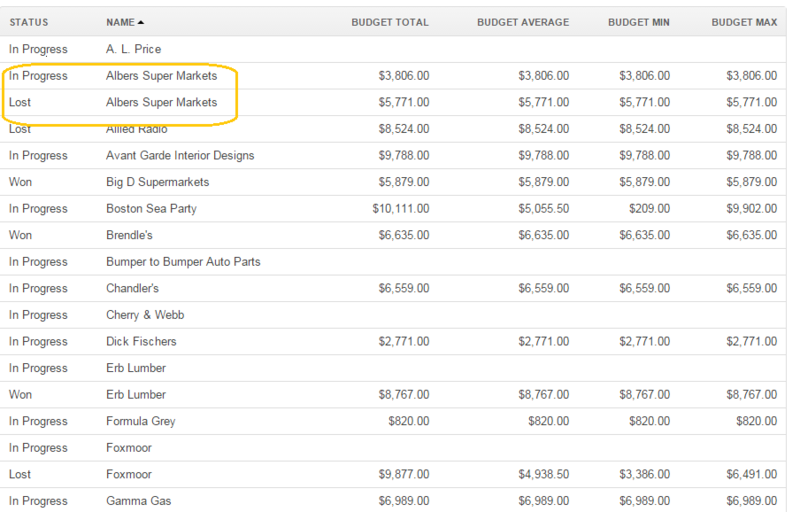 Now you can see the budget function values for all the opportunities with the same status that belong to a specific customer. First comes data for all the In Progress opportunities of one customer, then of another customer, etc., and only then you will see data for all the Won opportunities of each customer, etc. Once a report has been generated, you can click on the name of a column, to sort all the data in the report by the specified fields’ value (ascending or descending). You can see the report ordered by the Name value below. As you can see in the circled area, there are opportunities for Albers Super Markets that are in progress and that were lost. 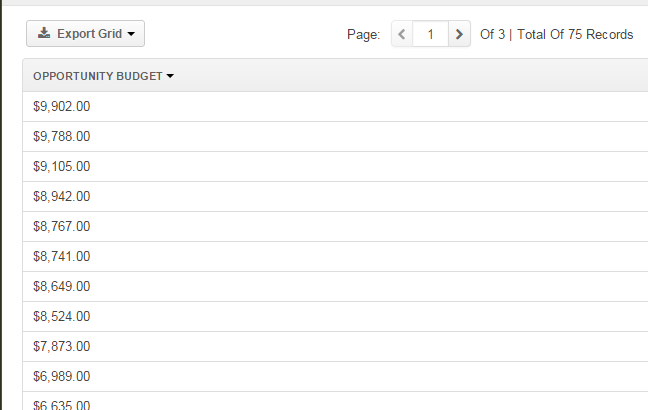 You can view the budget details for the both groups. If the customer’s name is the most important part of the grouping, it might be reasonable to edit the report and move the column to make it first. You can define conditions used to select specific records. Only data of the records that meet all the conditions defined in the Filters section will be used for the report. For example, you can create a report only for those customers, who appeared within the last month and live in Texas. Please see the Filters guide for more details. OroCRM supports line charts. To create a line chart for the report, go to the Chart and define the following fields (all the fields are mandatory and must be defined). 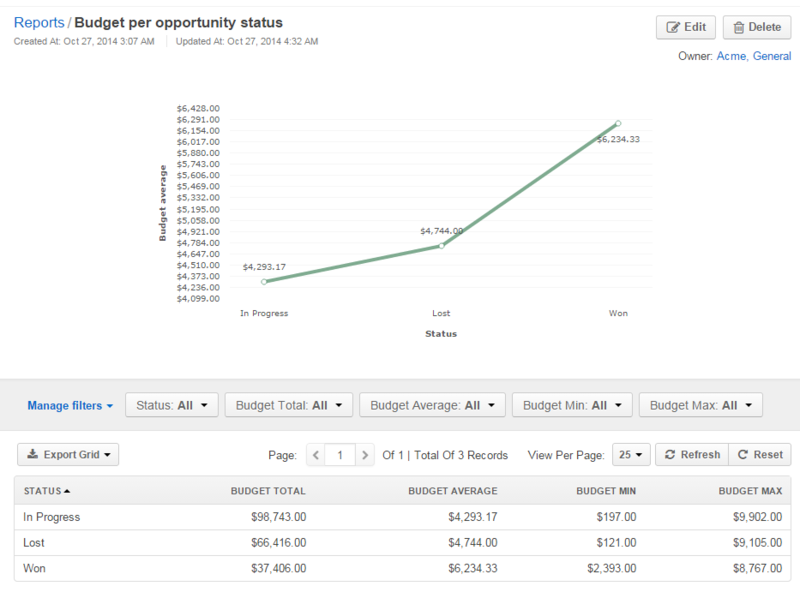 Let’s make a chart for the budget per opportunity status report (not grouped by customers). You can also get to the View page of a report directly from the Report & Segments menu (click the report name). Export the report data into a CSV format: click the Export Grid button. To avoid accidental data loss, there is an additional confirmation required to delete a report.